I mentioned this Air thing yesterday in my other blog. So, I tried it out today and wouldn't you know --- it doesn't work in Linux. Hmmm. But, it does work in OS X so I headed over to my much neglected Mac side. Sure enough it works here. I installed the two apps the guy in the link mentioned. Google Analytics works very nicely indeed giving a much more pleasing presentation of the info. 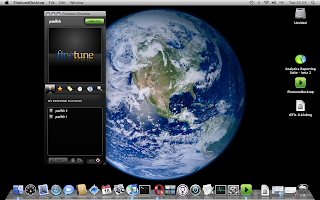 I also installed FineTune which is a sort of Pandora without the "USA only" restriction. Also works very well. Indeed, I'm listening to this as I type this. So, so far, Air looks very nice. I must check out some of their other apps.